During the Edo Period the Tokugawa Shogunate enforced a strict caste system upon Feudal Japanese society. Ruling Japan from 1603 A.D to 1867 A.D, the Tokugawa Shogunate ended when the fifteenth Tokugawa shogun resigned and returned power back to the Emperor. During the Tokugawa Shogunate ultimate power, and status within society, lay with the Shogun. Civil rights and influence diminished the further down one was in the caste system. With the lowest caste lucky if they had any influence or civil rights at all. Feudal Japanese society was essentially divided into four different castes. The Nobles (the Emperor, Shogun and Daimyos) held the greatest status and influence. The Samurai were below the nobles, and the second most powerful caste, having significant influence and rights within society. The Peasant caste were below the Nobles and Samurai, legally bound to their landlord, whom gave them land to farm, and entitled to some civil rights. The Chonin caste were the lowest caste in society even though they were the craftsmen, artisans and merchants of Japan. The merchants were the most despised people in the Chonin caste due to the nature of their occupation. Although not considered a caste, below the Chonin were the outcasts, who were more than just mere beggars. With the introduction of Buddhism people associated with death- such as executioners, hide tanners and butchers- also became the outcasts of society. Usually born into power, the Emperor was essentially a ceremonial figurehead during the Tokugawa Shogunate. However, he still had enough status with society to influence the people and nation as a whole. The Shoguns during the Edo period were Daimyo of the Tokugawa clan, and either fought their way into power or were born in to it. The Shogun and his Bakufu government held the right to govern due to their immense power and influence. However it was not without clever diplomacy that the Tokugawa Shogunate managed to hold onto power for 265 years. Since the other Daimyo, while governed by the Shogun and his Bakufu government, could rebel and fight for a change of government. Even after Tokugawa Ieyasu redistributed much of Japan's provinces to loyal allies there was still a chance that the Tokugawa Shogunate could lose power. To safeguard their power the Tokugawa Shogunate would require the other Daimyos to reside in Edo (Tokyo) with their families every second year. Every other year the Shogun required the Daimyos' heir to reside in Edo with his family. It deterred Daimyo from rebelling as the punishment would be the decimation of their clan's bloodline. During the Edo period the caste structure in Feudal Japan became very rigid. In Tokugawa Japan people were usually unable to improve their standing in society, forbidden to rise above their current caste. The Samurai, usually professional warriors, in the peace that followed the rise of the Tokugawa Shogunate became learned and practiced the principles of Bushido. During the period of peace the Samurai had abundant time to follow interests, such as becoming a scholar. While the peace ensured the Samurai would gradually became the aristocratic bureaucrats of the Edo period, with their swords becoming a symbol of status. Due to the rigid caste system, new Samurai were usually the descendants of an existing Samurai family. Peasants were bound to their landlord and farm by law during the Tokugawa Shogunate, and were required to grow the crops that fed the nation. Each harvest the government would tax the peasants for a percentage of their crop to feed the population. The peasants were usually the commoners of society who did not work as craftsmen, artisans or merchants (although some were also retired Samurai). The Chonin were the craftsmen, artisans and merchants of Tokugawa Japan and were usually the commoners who did not become peasants. There were several civil rights and responsibilities that went with each social class. The Samurai, for example, held the power to execute anyone of a lower caste who disrespected them. However, the Samurai were also expected to behave like gentlemen and act as role models to society. The peasantry had the responsibility to grow and harvest crops that fed the population. Whereas the Chonin were expected to produce fine works of art, construct and maintain buildings, (and when money became the new currency) be responsible for the lending of money to other people. The Shogun and his Bakufu were responsible for governing the whole of Japan, with the Daimyo administrating their provinces in accord. There were several methods which people used during the Edo period to hold onto, and gain, power in society. With the introduction of coins, which eventually replaced rice as the official currency, the Merchant class gained much wealth. With their new found influence the Merchants became sought after by several Samurai and noble families, who were eager to marry them in to their family to maintain their wealth and status. Warfare was one method of holding onto, as well as gaining, power. However, few people resorted to open conflict during the Edo Period, hence the long period of peace experienced. Some people in Tokugawa Japan may have also resorted to more malicious methods of maintaining their influence and status; such as assassination, bribery or theft. While the peasantry usually did not have much freedom under the caste system with the Samurai relocating to castle-towns and trade centers to act as bureaucrats and government officials they were often left unmonitored to live how they desired. The Chonin had little power, and the merchant Chonin were despised for their underhand ways of making profits until the change from rice to coins. However, the work of the Chonin, who were of professions such as carpentry, was greatly respected and after the change of currency to coins the merchants later became more influential and gained power and status. The outcasts had no influence, status or civil rights and were not even considered a caste during the Edo Period, and were treated harshly at times. Feudal society during the Edo Period was preferential to those who had influence and status. Like several feudal societies throughout Europe; those who were lower in the caste system had less influence, status and rights within society. However, the aim of having an even stricter rigid caste system eventually fell apart due to internal economic pressures, much of it due to the changing of the currency to coins from rice. Causing many Samurai and Nobles to marry rich merchants into their families to maintain their influence and status, which helped to break down the rigid caste system desired by the Tokugawa Shogunate. I'm surprised that artisans were on the bottom rung with the traditional Japanese interest in aesthetics. Although, I was under the impression in the mid-late Edo Period Merchants and Artisans ascended the social ranks? Do you know anything of this? I think it was because of the relative peace that the Tokugawa Shogunate maintained. Made some revisions to hopefully clear up some spelling and grammatical errors. Rephrased some sentences, or paragraphs, so they make more sense at the same time. Much of it had to do with the relative peace experienced during the Edo Period. Another factor was the introduction of coins as the official currency in the place of Rice. Before the the introduction of coins the Samurai had peasants to grow rice for them making them wealthy without having to focus away from their martial or scholarly activities. With the introduction of coins many in the Chonin class became rich, especially the merchants, due to the nature of their trade. With the Samurai focused on government duties and practicing the way of Bushido they had little time left to make enough money to maintain their wealth, which in turn affected their influence and status. So in order to maintain their status they married the increasingly wealthy merchants in to their Samurai families. This had the adverse effect of turning the caste system on its head as Chonin were not meant to leave the Chonin caste and become part of Noble or Samurai families, and the castes those families belonged to. So in the end the dream of a structured, and very rigid, caste system fell apart. I saw a documentary a little while ago about the Samurai in the Edo period and how they felt unecessary due to the relative peace. This 'identity crisis' is what led to the spreading of martial arts in Japan and might have also contributed to the caste system flipping itself upside-down. Very nice! Clear, concise, detailed. Feudal Japanese society was essentially divided into four different castes of diminishing influence, status and civil rights. 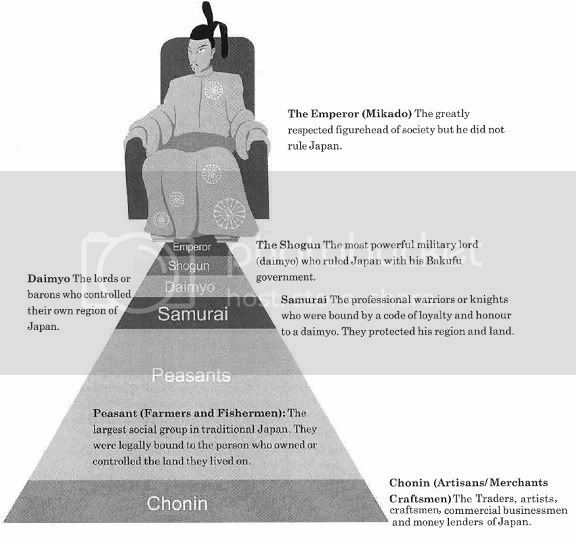 Feudal Japanese society was essentially divided into four different castes. With the introduction of Buddhism people associated with death; such as executioners, hide tanners and butchers; became the outcasts of society. With the introduction of Buddhism people associated with death- such as executioners, hide tanners and butchers- also became the outcasts of society. Unlike in modern society where someone can freely move between the different classes. Never fear, I was hoping you would come along and point those out so I could fix them. Revision #2 is go. Issue #6 - Removed the fragmented sentence. Seems to read quite quite fine without it. I could not think of a way to make it a complete sentence, for now.